Samsung has revealed a new line-up of handsets - named REX - that it plans to launch with lower specifications in order to compete with Nokia for the all-important emerging markets. 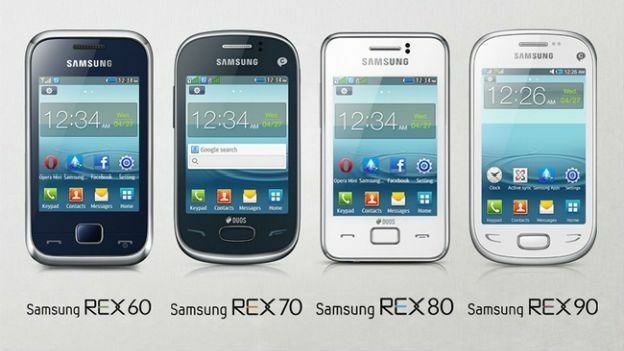 The four phones are labelled REX 60, REX 70, REX 80 and REX 90 and all run a Java-based operating system with Samsung's TouchWiz UI. Appearance-wise, the handsets look like scaled down versions of the company's flagship Samsung Galaxy S3 handset. The REX phones all feature dual-SIM slots allowing them to support both data and call tariffs and sit comfortably between being a feature phone and a fully-fledged smartphone. Apart from the REX 60 - all the models will feature a capacitive touchscreen. It's clear the South Korean company is planning on competing with Nokia for the potential customers in emerging markets like Brazil and India. According to Forbes, the emerging market division of Nokia accounts for 20 per cent of the company's value and last year it released two new Asha handsets to try and secure its position. While Samsung hasn't yet confirmed the pricing of the REX handsets, estimates put the range at between £50 and £80. "As the number one mobile leader and innovator, we are committed to developing the best possible mobile solutions to suit all lifestyles and budgets, which is why we are so excited to launch the REX series across a number of the world's fastest growing markets,' said JK Shin, president and head of IT & Mobile Communications Division at Samsung Electronics.